70th Post: Reader Survey and a Giveaway! It's my 70th post, Yippee and I'm pretty excited. I met two readers over the weekend, one of them is a corper in Agege and the other is a blogger. It made me really happy to meet readers I didn't know personally. I've been wanting to carry out a survey on the blog for a while now and I finally got round to creating it (Say No to Procrastination, folks). It's 25 questions long, some of the questions are multiple choice, some are simple yes or no's and there are open ended ones too. It's your chance to give feedback and also an opportunity for me to make some changes. Please answer the questions, the survey will only run for a week and it'll make me really happy if you do so. Now, on to more interesting things. My female readers on Healthy Hair Journey's should know who Dabs is, she blogs at Naija Hair Can Grow and has inspired many ladies to take better care of their hair. She also has a salon called Savvy and Chic Hair & Beauty Hub which she started due to the demand she received from her readers. I have been there a few times and the customer service was great. I got Crotchet Braids done in Easter, I have bought their whipped shea butter and I ordered my Giovanni Smooth as Silk Conditioner from them when they had a blogversary sale. Remember this post? I told you how I went for a Salon Day out and I won a Secura steamer but I had left when the raffle draw was being held so someone else got it. Well, here's a picture of Dabs and I from that day. 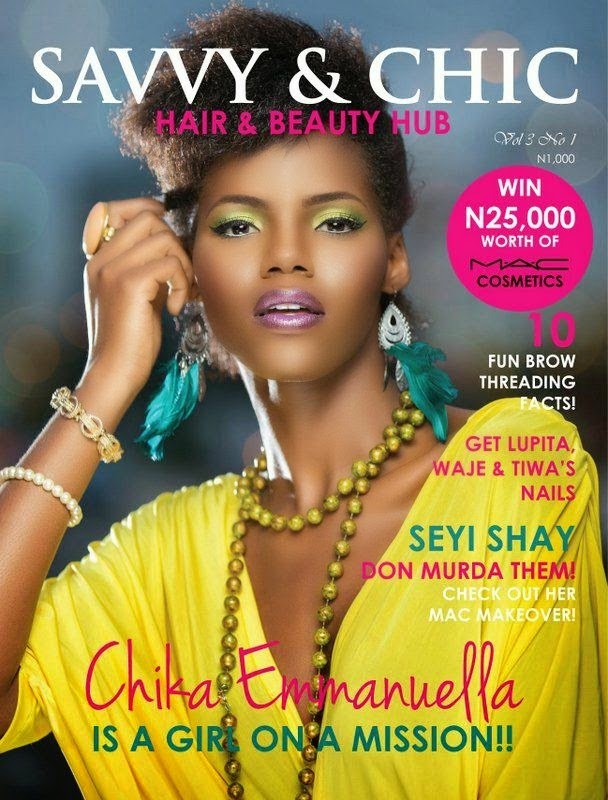 Savvy and Chic Hair & Beauty Hub is having a Floral Themed Garden Party on the 28th of September to celebrate the 3rd edition of their magazine. 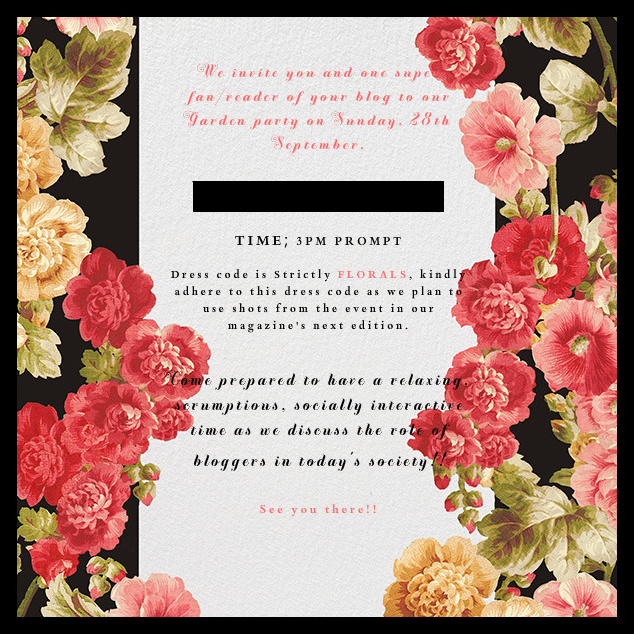 It's a beauty party for bloggers and guess what, I'm allowed to bring one Blog reader along with me. They actually had a tea party for bloggers on the 16th of May when they launched the second edition and you can look at pictures here to get an idea of how fun it was. iii) Comment on this post with your email address so I can confirm you filled in the Survey. The Survey closes on Tuesday, the 23rd of September and my date for the party will be announced the next day, Wednesday the 24th. Start planning your floral outfit o as pictures taken on that day will be featured in the next edition of the magazine. It could be a flower crown, floral top, dress, skirt, pants or even just a floral brooch. not sure I remembered to add my email tho. I wrote "Keep being who you are. you're awesome! " Aww, Nice. Yeah, I saw that comment. Thank you Sogie, if you're willing to travel to Lagos for it then feel free to take part. *sigh* I'll love to come . congrats on your 70th post! I would love to come! You are already prepared, that's good. Congratulations on your 70th post. Congratulations Tuke on your 70th Post! !